Raymond Leslie Baxter's photograph album came to Auckland Libraries as the result of a donation to the old Waitakere City Council. This donation might have been made after the tragic death of the album's owner, Miss Beverley Price, in the 1979 Air New Zealand crash at Mt Erebus in Antarctica. The photographs were taken by Beverley Price’s uncle, Raymond Leslie Baxter. They document his brief military career at Featherston Camp between July and December 1917. The details of this can be traced by consulting his army personnel file on Archway, Archives New Zealand’s system for government records. Baxter was a 28-year-old clerk from Newton who worked for the Auckland Education Board. 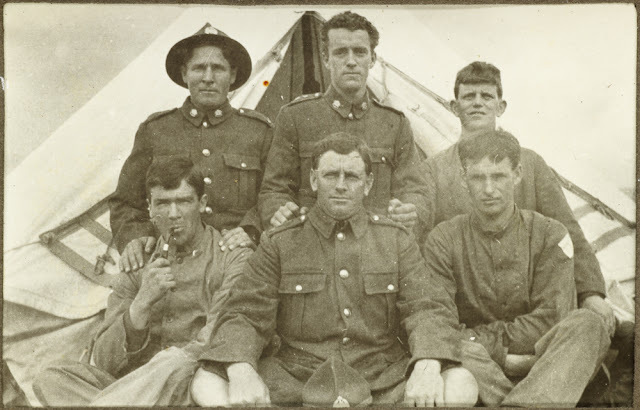 In early 1917 he was called up and, along with his fellow recruits, transported by train to Featherston Camp in the South Wairarapa. 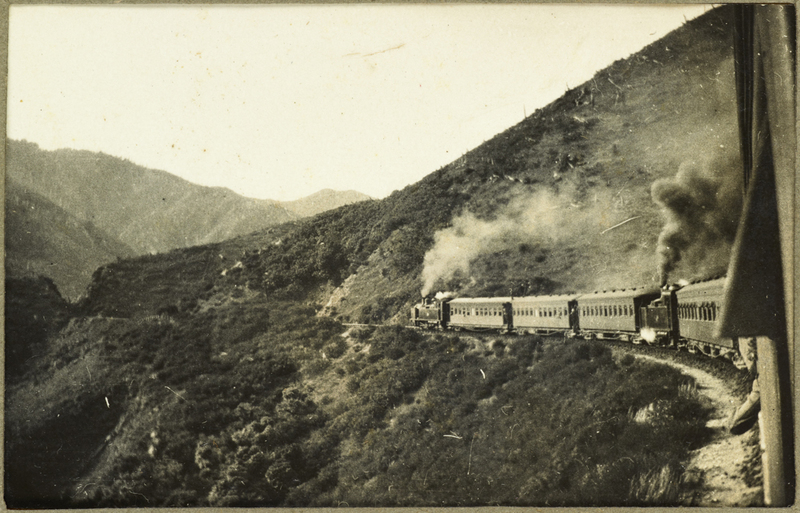 His album includes three images of the troop train winding its way along the Wairarapa line across the Rimutaka Range. The Wairarapa Line railway across the Rimutaka Range, 1917. Auckland Libraries Heritage Collections, BAX-PA-12-4. 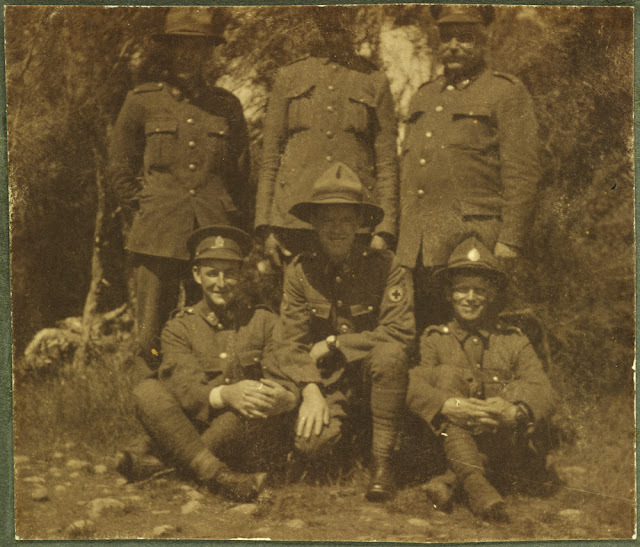 Featherston Camp had been opened in January 1916. 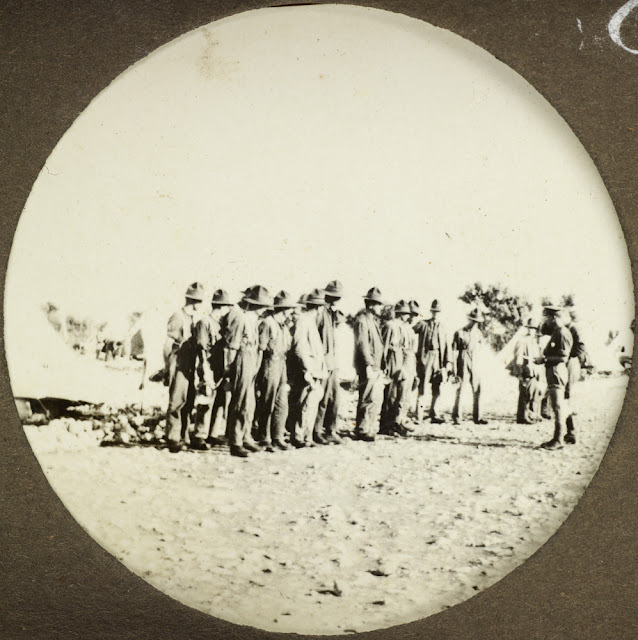 The camp covered an area of 1861 acres (783 hectares) between Featherston and Greytown on the Tauherenikau River. 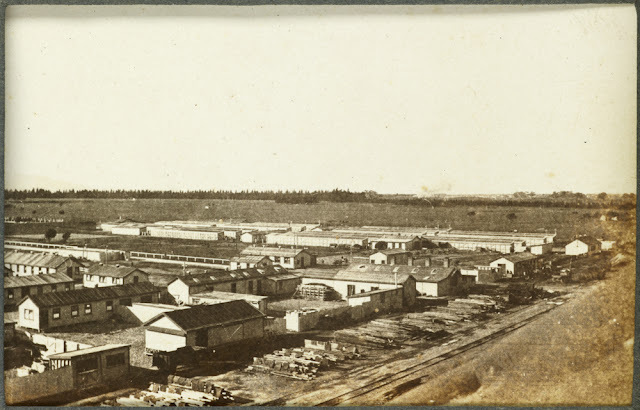 Eventually Featherston and its satellite camps at Papawai and Tauherenikau could simultaneously accommodate 9850 men in over 250 buildings and tents. Between 1916 and 1918 over 60,000 troops received about four months’ training at these camps before they were sent overseas. 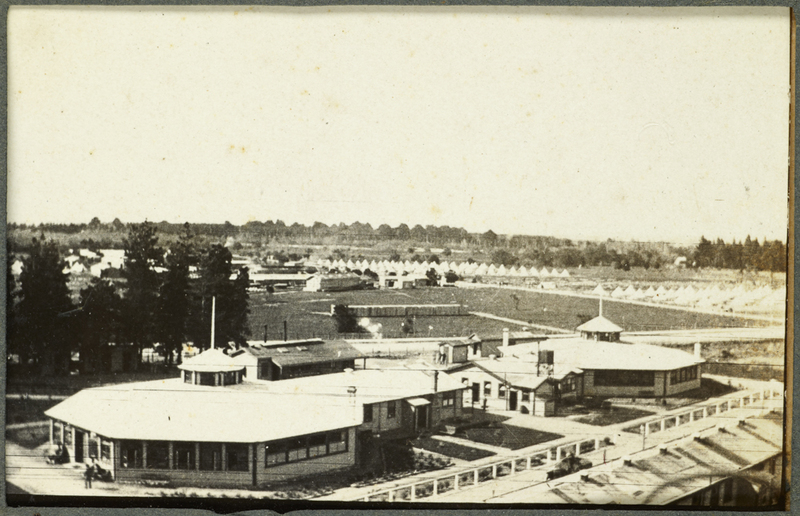 Featherston Camp from the Salvation Army Institute Tower, 1917. Auckland Libraries Heritage Collections, BAX-PA-3-8. Featherston Camp viewed from the Salvation Army Institute Tower, 1917. Auckland Libraries Heritage Collections, BAX-PA-3-6. The two octagonal rotundas that you can see in the photograph above were joined together by connecting corridors to make the main hospital for Featherston Camp. The rotundas were specially designed with sides that could be opened and closed (depending on the weather) so that sick soldiers with respiratory diseases would benefit from a constant supply of fresh air to the wards on their open balconies. 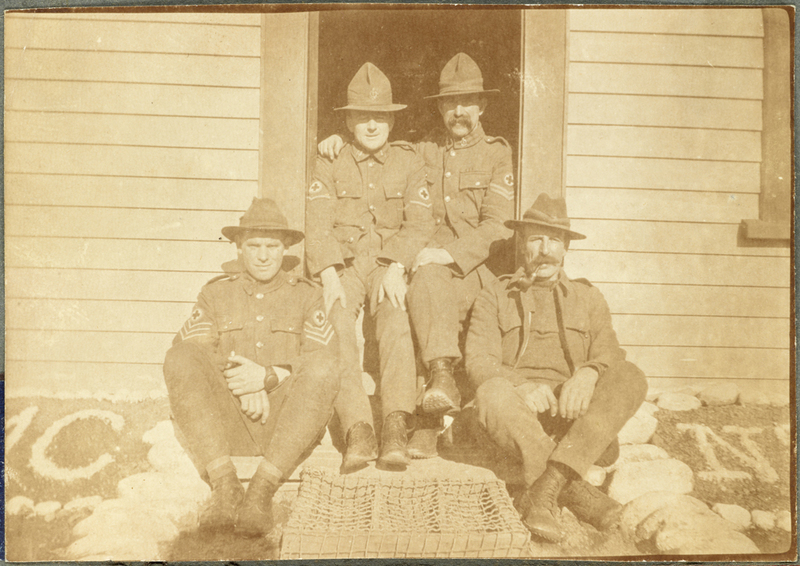 Group of soldiers in uniform, 1917. Auckland Libraries Heritage Collections, BAX-PA-2-1. 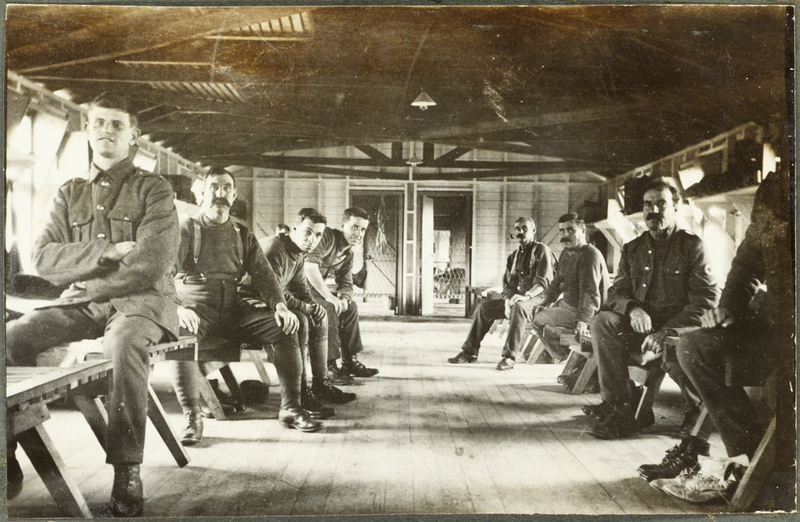 Soldiers at Featherston Camp, 1917. Auckland Libraries Heritage Collections, BAX-PA-23-2. Soldiers on steps at Featherston Camp, 1917. Auckland Libraries Heritage Collections, BAX-PA-23-3. Soldiers being vaccinated at Featherston Camp, 1917. Auckland Libraries Heritage Collections, BAX-PA-4-6. 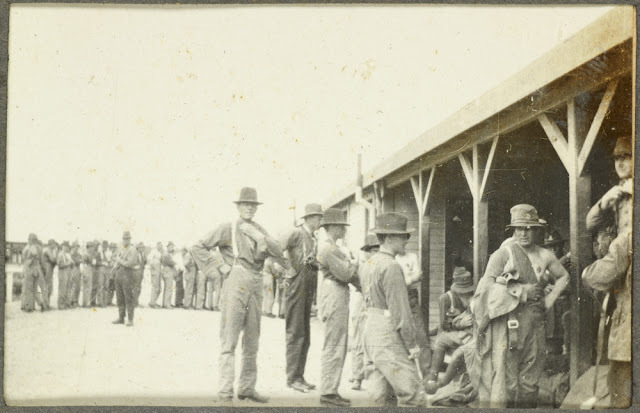 Tauherenikau Camp Gargle Parade, 1917. Auckland Libraries Heritage Collections, BAX-PA-11-4. 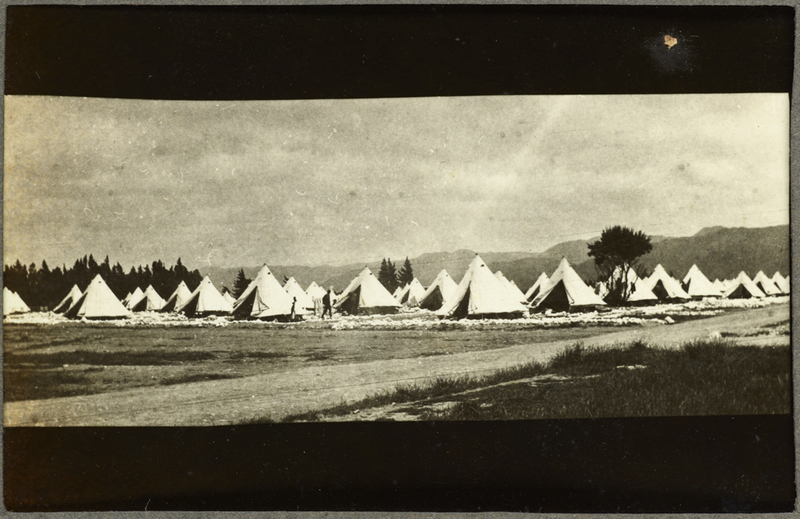 Tents at Featherston Camp, 1917. Auckland Libraries Heritage Collections, BAX-PA-4-3. 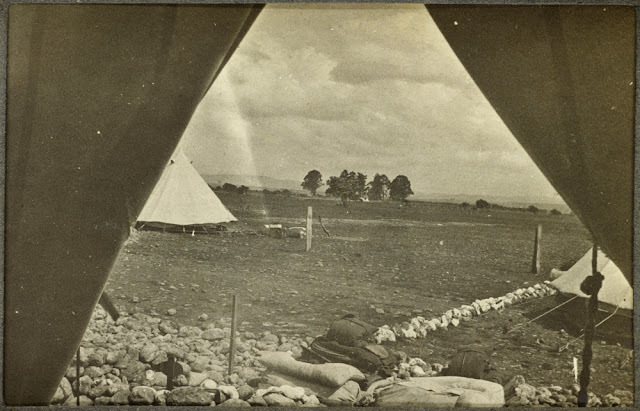 View from my tent, 1917. Auckland Libraries Heritage Collections, BAX-PA-11-5. Group in front of tent, 1917. Auckland Libraries Heritage Collections, BAX-PA-16-4. 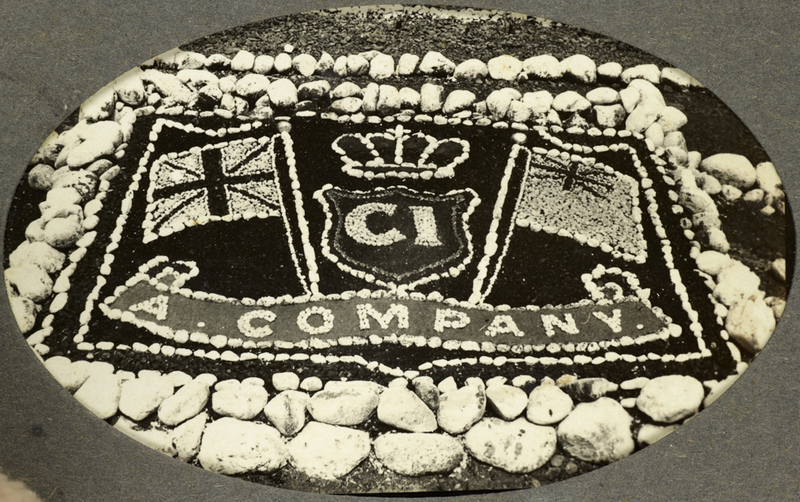 A Company design laid out in rocks at Featherston Camp, 1917. Auckland Libraries Heritage Collections, BAX-PA-4-7. Tauherenikau Camp 6am fatigues. Auckland Libraries Heritage Collections, BAX-PA-8-6. 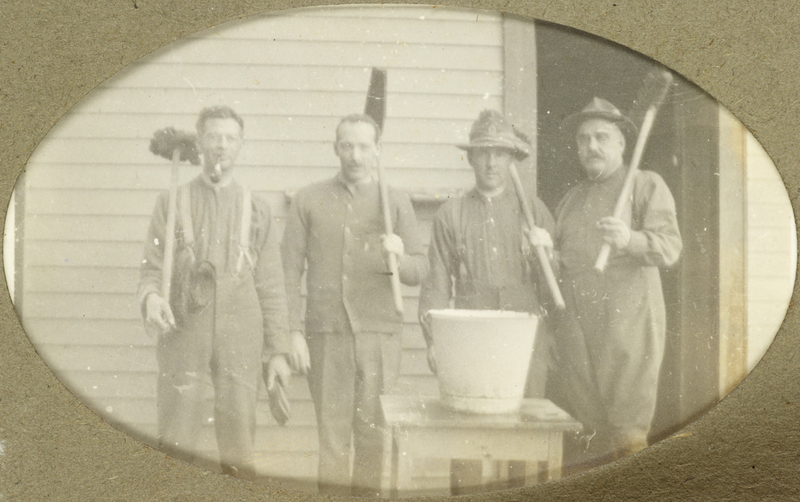 Cleaning detail at Tauherenikau Camp, 1917. Auckland Libraries Heritage Collections, BAX-PA-18-7. Captain Wheeler, 1917. Auckland Libraries Heritage Collections, BAX-PA-18-5. The Medical Board found that, apart from his poor eyesight, Baxter still had a bad chest and was ‘weak internally’ and ’abdominally unfit.’ The board also discovered that he now had weak ankles. The board concluded Baxter’s condition was not improving and that he was 'not able to carry on.’ It recommended ‘that the soldier be discharged from the Expeditionary Force’ but that he should not be eligible for any future pension. 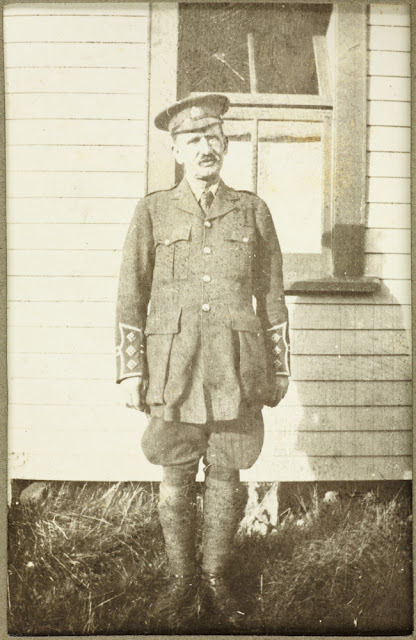 After he had been allowed to return home to Auckland, Baxter received a letter on 22 April 1918 informing him that the army’s Special Re-examination Medical Board had decided ‘you will not be called up for re-examination by the C2 Re-examination Board. You will therefore continue on leave without pay until further orders.’ Raymond Baxter was almost free from the army’s iron grip, because there his file ends. It seems the army was no longer interested in him. Auckland Libraries also has other manuscript material relating to Featherston Camp. Bookseller Alfred Hamish Reed volunteered and was sent to Featherston Camp with the 21st Reinforcements. Although very fit and classified as A grade physical material, the army decided Reed was too old to fight (he was 41). The army also discovered he had valuable shorthand and typewriting skills, which it thought would be better used at Featherston rather than wasted in the mud of Flanders. Reed was therefore transferred to the headquarters company and, against his wishes, made a clerk and stenographer. During his spare time there he wrote, illuminated and printed In and around Featherston Camp, which you can find as NZMS 1827 in Auckland Libraries’ New Zealand Manuscripts Collection, and read about in this previous blog post too. Journalist Hector Bolitho (another C1 man), edited the Featherston Camp Weekly, which is available from the Auckland Libraries’ catalogue in digitised form. In 1918 he also published The Book of the C1 Camp: Tauherenikau M.C. The books by Bolitho and Reed can both be read in the Sir George Grey Special Collections Reading Room. Finally, if anyone reading this blog has any other information they can share about Raymond Leslie Baxter or the Baxter Photographic Collection please do let us know by commenting below. 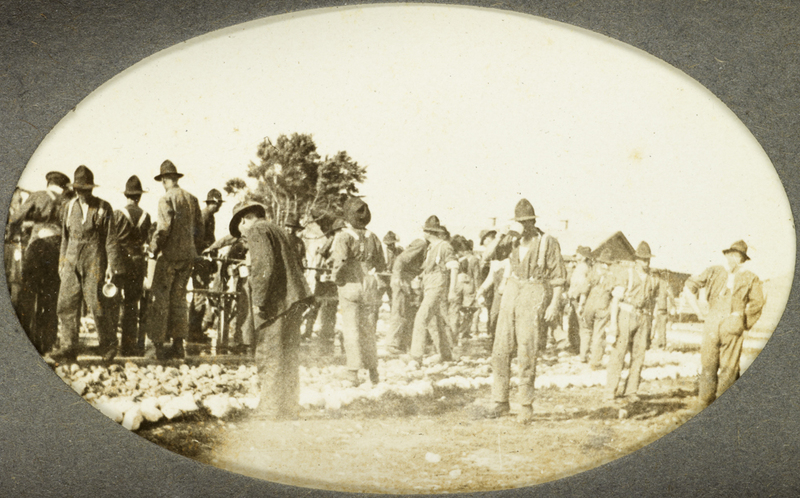 Featherston camp, Ministry for Culture and Heritage, updated 5-Aug-2014. Tim Shoebridge. Featherston Military Training Camp and the First World War, 1915–27, Wellington, 2011. Interesting to see the octagonal features of the camp hospital - similar to those at Queen Mary Hospital, Hanmer Springs, and King George V Hospital, Rotorua - each built around the same time and a very graceful and practical design in my opinion.